Our GMS is based on integrating the information captured from the field equipment through IoT and make it useful (accessible, easy to read and automatic decision-maker) for airport stakeholders. This is possible because we design each architecture totally customised for every customer, so the GMS they get is specifically oriented to their requirements, and not a standard solution or application. The monitoring part of our solution, the Centralized Monitoring Solution (CMS), provides detailed information of the airport layout, divided into lawyers, so every user can reach the specific gate or airport area, and go into the detail of the searched asset within the airport, getting in real-time all its data and how it interlinks with airport operations. This means not only airline information, aircraft type and plates, arrival and departure times, but also all type of technical information that can help airport stakeholders to take immediate decisions. It also integrates the maintenance module or Maintenance Management Solution (MMS), with which every action taken on each asset is immediately reported and logged, helping airport maintenance department to see the complete picture and take necessary actions, coordinated with operations. This is very useful for capacity and resources planning, moreover when through its mobile application every action is communicated to the field technicians, allowing them to answer on the spot, thus reducing out-of-service ratios and increasing SLAs achieved. 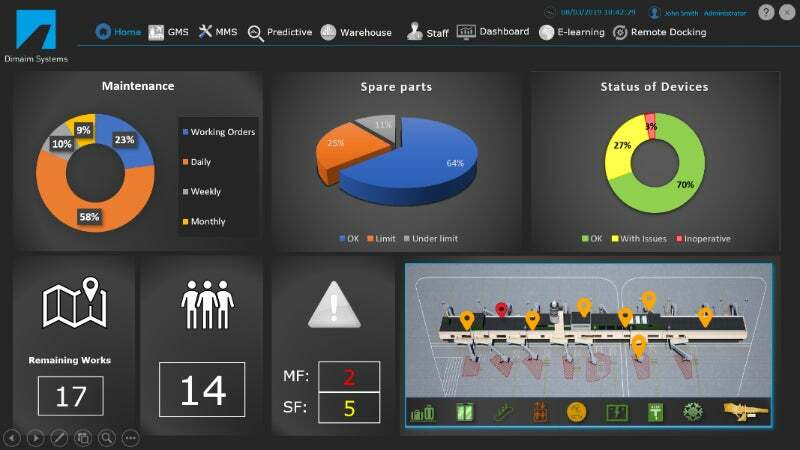 Another unique characteristic of our GMS is that through artificial intelligence and rules it analyses the different information captured either during the operation or maintenance of the assets, and it turns it into precise orders / operations / actions, thus permitting, for example, automatic auditing of maintenance performances, re-scheduling of pending work-orders or unperformed preventive maintenance tasks. In general, it provides stakeholders with straightaway solutions to daily operations at the airport. The expandable architecture is aimed at growing and changing with the airport, so we have solutions based on local servers, either physical or virtual, as well as Cloud-based ones, being a common feature on all of them the active redundancy and the ownership of all data belonging to the customer. In addition, the capacity to integrate our solutions with Maximo or SAP, commonly used at airports, make our developments the perfect approach.